Employee Tip: Problems Getting in Touch With an Employee Rights Attorney? If you are an employee who is having trouble getting in touch with an employee rights attorney, please know two things: (1) your frustrations are entirely understandable- chances are, you are calling about serious, and perhaps urgent, employment issues that seriously affect your life and income; and (2) there are often several legitimate reasons (having nothing to do with anything negative about you) why an attorney cannot speak to you as soon as you’d like or need. My best advice for you is this: research and find one or two employee rights attorneys who strike you as knowledgeable (or are recommended as knowledgeable by a reliable source) and be politely persistent until you get a chance to speak to one of those attorneys. If you search long enough, and if you bring a big wallet along, you will eventually find the right attorneys to Pump (PAUSE, CLAP) You Up. And at some point (well short of the Supreme Court or “vindication”) you will realize that you have spent a lot more money on legal fees than you needed to, and you probably WILL “settle with those people” (or, at least you’d BETTER). And the settlement will be a disappointment to you as compared to what you had believed back when your attorney was vocal about pumping you up, and silent about the multiple risks of deflation. 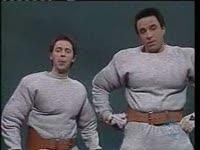 But at some point you’ll see it’s better to cut your losses than continue to pay Hans and Franz’s membership fee.